A range of zinc plated steel collars to provide secure axial location of drive components such as gears or pulleys on shafts and axles. Select from our range of collars below. 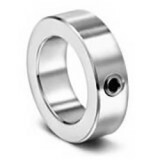 Plated Steel S/Screw Collar, 1/8" I/D, 0.32" O/D, 0.2" wide. ..
Plated Steel S/Screw Collar, 3/16" I/D, 7/16" O/D,1/4" wide. ..
Plated Steel S/Screw Collar, 3mm I/D, 7mm O/D, 5mm wide. ..
Plated Steel S/Screw Collar, 4mm I/D, 8mm O/D, 5mm wide. ..
Plated Steel S/Screw Collar, 5mm I/D, 10mm O/D, 5mm wide. ..
Plated Steel S/Screw Collar, 6mm I/D, 10mm O/D, 5mm wide. ..
Plated Steel S/Screw Collar, 8mm I/D, 16mm O/D, 8mm wide. ..